Where Do Missionary Nurses Work? 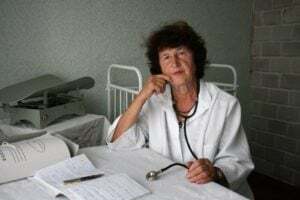 A missionary nurse cares for patients in underdeveloped and developing regions of the world, usually through work with religious groups or churches, non-profit organizations and humanitarian groups. Missionary nurses provide much needed basic healthcare in areas of the world that may not have access to medical technology or necessary resources such as antibiotics, vaccines or even clean drinking water. In addition to providing healthcare services, missionary nurses also provide spiritual care for their patients, often sharing their religious beliefs with the local community. As in other nursing careers, aspiring missionary nurses must first complete their Associate's Degree in Nursing or Bachelor of Science in Nursing degree and pass the NCLEX-RN exam. During the course of the nursing education, elective courses in international nursing and/or foreign languages would be particularly useful for a missionary nurse. In addition, missionary nurses must have a strong foundation in spiritual beliefs and religious knowledge in order to work with a church or other religious organization. To search and apply for current missionary nurse positions, visit our job boards. What Are the Education Requirements for Missionary Nurse? A position as a missionary nurse requires an ADN or BSN degree as well as an active RN license. In addition, a background in religious studies, international nursing and/or foreign language skills are particularly helpful and professional nursing experience is generally required. Missionary nurses must also hold a current unrestricted travel visa and valid passport. Nursing licensure in the country where they will be practicing may also be required and is often coordinated by the organization for which a missionary nurse works. While not always a requirement for missionary nursing positions, many missionary nurses hold the Basic Life Support Certification (BLS) from the American Heart Association or American Red Cross. Additionally, missionary nurses must hold a current unrestricted travel visa and valid passport before they can leave the U.S. to work as a missionary nurse. Research faith based nursing schools. Missionary nurses work all over the world in underdeveloped and developing regions in need of basic healthcare services. They often work with churches, non-profit organizations and humanitarian groups, who coordinate the logistics of their travel and assignments. In the field, missionary nurses may treat patients in hospitals, clinics or rural areas visiting patients at home or in community centers, churches or schools. Missionary nurses perform the same basic tasks as traditional RNs, including assessing and caring for patients who are ill or injured. As part of their daily work, they may administer vaccinations and medications, dress wounds or treat broken bones. In addition to these tasks, a key component to missionary nursing is working in an environment with limited resources, such as a lack of clean running water, electricity or telephone service. Because preventing illness and infection is critical in these locations, missionary nurses also work to educate patients and communities about proper hygiene, how to prevent infection and the spread of disease as well as basic health and dental care skills. Providing spiritual counsel to patients is also a key component of the missionary nurse's job, which may include preaching, distributing or telling religious stories or sharing their individual beliefs. Depending on the location and organization a missionary nurse works with, he/she may also participate in non-medical humanitarian efforts such as digging wells, building homes or teaching basic skills like reading and writing. What Are the Roles and Duties of a Missionary Nurse? Missionary nurses generally enter the field because they consider it their spiritual or moral calling, rather than focusing on the salary to be made in the field. In fact, many missionary nurses work as volunteers. However, salary varies widely based on the organization that employs the nurse, and there is a high demand for trained medical staff to work in impoverished areas of the world.